Various programs for detection of potential anticancer drugs have been developed during the last 25 years. The technology utilized in such programs commonly was based on experience in screening for antimicrobial drugs. Frequently, materials, after being tested for their antimicrobial properties, were also evaluated in vivo against several animal tumors. With time it became obvious that the in vivo systems had too many disadvantages and are not ideal as the primary screen. People began to look for in vitro systems — pre-screens — that would make it possible by using a simple technique to pre-select candidates for in vivo testing from large number of samples. Most in vitro pre-screens are non-specific and would detect antitumor compounds regardless of their mechanism of action. Systems based on in vitro inhibition of growth or metabolism of KB, HeLA or L1210 cells would fit into this category. However, it is possible to design in vitro pre-screens to detect only drugs with a specified biochemical effect. Thus, in our laboratories we have developed an in vitro system for detection of drugs with antimetabolite mode of action (1). Another good example is the system designed to detect specifically DNA-interfering drugs as that described by Dr. W. Fleck from Jena in Germany (2). 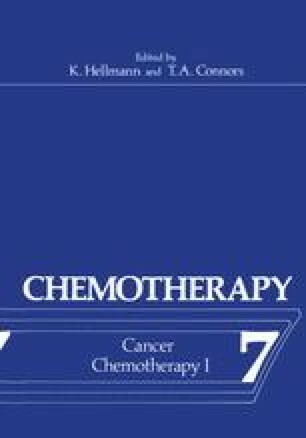 Supported by Contract N01-CM-43753 from the Division of Cancer Treatment, National Cancer Institute, National Institutes of Health, Department of Health, Education, and Welfare.